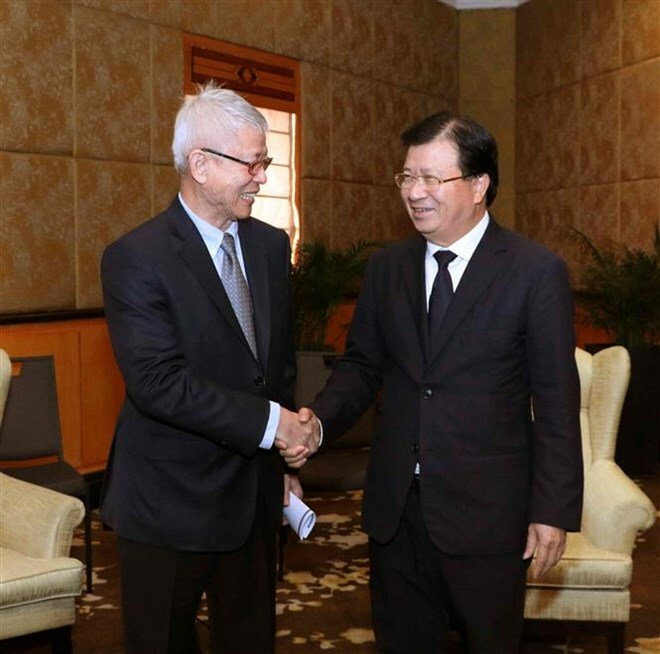 Hanoi (VNA) – The Vietnamese Government, ministries, and sectors always create favourable conditions for foreign investors, including those from Thailand, to expand production and business in Vietnam, Deputy Prime Minister Trinh Dinh Dung has said. Hosting a reception for Executive Director of the Thai-based Siam Cement Public Company Limited (SCG) in Vietnam Dhep Vongvanich on April 9, Deputy PM Dung laid stress on the Vietnam-Thailand strategic partnership, which has been developed comprehensively in various sectors, particularly economic, trade, and investment cooperation. He spoke highly of SCG’s chemicals and construction materials operations in Vietnam, contributing to the sound relations between the two countries. He urged the company to speed up its 5.4-billion USD Long Son petrochemical complex in the southern province of Ba Ria-Vung Tau, and ensure that it is carried out in an effective manner, in line with Vietnamese regulations on labour safety and environmental protection. Dhep Vongvanich, for his part, affirmed that his firm will mobilise resources to complete the petrochemical complex soon, and organise training courses for local people so that they can work at the construction sites and plants or provide supporting services when the complex begins operation. The complex will create tens of thousands of jobs to local labourers, he added.